This photograph, taken by Leonard Alderman, was shot at what is now the intersection of Routes 4 and 179. The white building is the former Burlington Inn, which was damaged beyond repair by the flood. The helicopter in the upper part of the picture was part of a rescue operation undertaken by the U.S. Marines; the rope used to hoist survivors from the roof of the Burlington Inn is just visible. Hurricane Connie blew through Connecticut on August 13, 1955, dropping between four and six inches of rain on the state. When the remnants of Hurricane Diane hit the state just five days later, the ground, already saturated, could not hold any more water. As much as twenty inches of rain fell over a 36-hour period from the morning of Thursday, August 18 into Friday, August 19. And on Friday, the floodwaters came. Connecticut’s major rivers, including the Farmington, swelled to well beyond flood stage. Smaller streams flooded as well, so the damage was not restricted to the larger river basins. The floods affected sixty-seven Connecticut towns, leaving more than 100 people dead and 1,100 families homeless. Damage was estimated at nearly half a billion dollars. In fact, in 2000 the National Hurricane Center named Diane the sixth most costly hurricane in United States history. In Burlington, the flood led to the destruction of eleven bridges, including ones on Scoville Road, Milford Street, and Monce Road. The spillway of the New Britain Reservoir in Whigville was damaged. On Arch Street and in the area of town known as Wilkinsonville, on the banks of the Farmington River, sixteen homes were demolished or washed away entirely. Six more, including the Burlington Inn, were rendered unusable and had to be torn down. Two hundred town residents were left homeless. Luckily, Burlington was spared the fate of other area towns and suffered no fatalities. Because so many bridges were washed out in Burlington and elsewhere, travel between towns was very difficult. Supplies had to be flown in from Hartford by helicopter. At the emergency headquarters set up at Burlington School (now the Burlington Town Hall), more than 700 typhoid shots were given to survivors; more than 200 residents got their shots at a second emergency shelter at the Lake Garda Clubhouse. The flood changed people’s lives and etched itself into the collective memory. 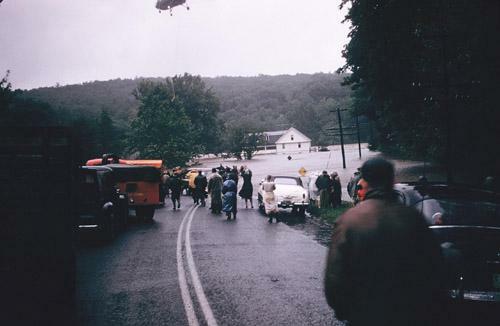 It became part of the lore of the Farmington Valley and surrounding areas — when residents talk about “the flood”, it is immediately understood that they mean the events of August 19, 1955. Originally written by former local history specialist Ann Mazeau for the 2005 exhibit “Flood Friday: August 19, 1955” at the Burlington Public Library commemorating the 50th anniversary of the Flood of 1955. Connecticut State Library’s finding aid for RG 039, Flood Recovery Committee, 1955-1956. Coverage of the 55th anniversary of the Flood of 1955 from The Hartford Courant. 8-minute video about the Flood of 1955 excerpted from the CPTV original program, When Disaster Struck Connecticut. To see more materials about the Flood of 1955 in Burlington, visit the Burlington Room at the Burlington Public Library.